The Patios at The Meadows by Ryland Homes offers low-maintenance homes in an active lifestyle community just 20 minutes south of Denver. 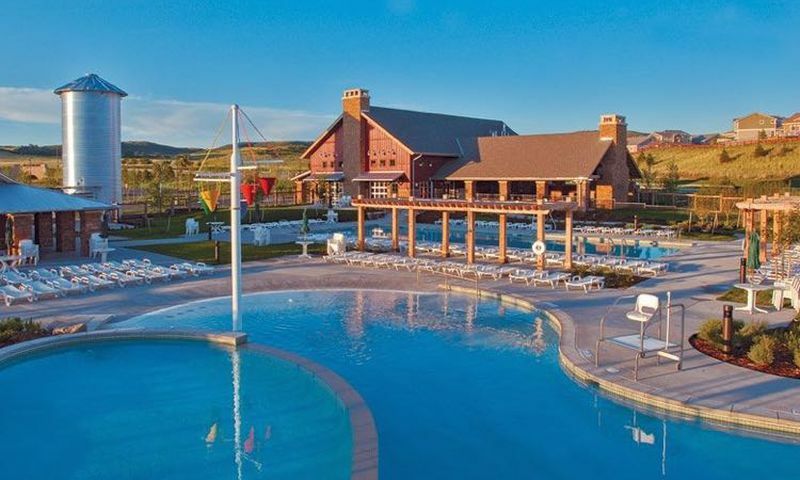 Located in Castle Rock, Colorado, The Meadows is a master-planned community that encompasses over 1,100 acres of outdoor space and scenic views at the foothills of the Rocky Mountains. Residents have an abundance of outdoor amenities, providing unique ways to stay fit and active throughout the year. The heart of the community is located within The Grange Cultural Arts Center. Here you’ll often find residents gathering for special events in the ballroom and utilizing the catering kitchen for club meetings. The multiple meeting rooms are great multi-purpose facilities that can be used for classes, clubs, or crafts. Located just outside of The Grange residents have access to three swimming pools and a lovely outdoor patio. True to the Colorado lifestyle, The Meadows’ master plan includes hundreds of acres throughout six recreational areas. Native Legend Open Space includes a 3.2-mile trail for walking, biking, and hiking. Residents can enjoy outdoor concerts at Butterfield Crossing Park as well as a 25-meter outdoor pool. Here you will also find sport courts and a playground for kids. Located adjacent to The Grange Cultural Arts Center is Paintbrush Park. It includes a picnic area, dog park, rock climbing wall, baseball fields, and horseshoe pit. Residents can also access East Plum Creek Trail through Paintbrush Park. Other outdoor amenities within The Meadows can be found throughout Ridgeline Open Space, Bison Park, and Philip S. Miller Park. Ryland Homes is developing new construction patio homes within the master-planned community of The Meadows. The Patios at The Meadows offers two home styles: attached villas and detached single-family homes. These unique floor plans include first-floor master suites and a variety of bedroom options. All homes include an unfinished basement with the option to build a complete basement that includes an extra bathroom or entertaining space. Patio villas are offered in six models that range in size from 1,552 to 1,733 square feet. They include one to two bedrooms, one-and-a-half to three bathrooms, and an attached two-car garage. Homebuyers can select a detached patio home from five models. These larger home options offer between 1,714 and 2,144 square feet of living space. They include one to three bedrooms, one-and-a-half to three-and-a-half bathrooms, and an attached two-car garage. Homebuyers will be attracted to The Patios at The Meadows for its maintenance-free homeownership. This leaves homeowners with more time to enjoy the active lifestyle that The Meadows promotes. Whether looking to stay socially active or physically fit, there will be something for almost any interest. There is a calendar full of activities, events, and classes held in the community throughout the year. Attending a class like floral design, cake decorating, or home-painting all provide great ways to learn a new hobby. Common interest groups meet often for bridge, cycling, hiking and more. Whether attending a holiday party, concert series, or dinner party, living at The Patios at The Meadows will keep you as busy as you’d like. The Patios are located within a larger community, The Meadows, in Castle Rock, Colorado. With easy access to Interstate 25, attractions, shopping, and downtown Castle Rock are all just minutes away. This area is an outdoor adventurer’s paradise with miles of trails and open spaces throughout Douglas County. Castle Rock has five area golf courses as well as breweries, farms, gardens, and more. When traveling farther is necessary, homebuyers will be pleased to know that the Denver International Airport is located about 45 minutes north. Residents will enjoy the thoughtfully designed Patios at The Meadows which provides them with more time to explore Castle Rock, Colorado. The Grange Cultural Arts Center is home to dozens of events and activities. As the heart of the community, residents enjoy getting to know neighbors and learning new hobbies at The Grange. Native Legend Open Space includes miles of trails that allow walking, biking, and hiking. It's 3.2 miles long and includes 100 acres of open space. This 28-acre park offers plenty of outdoor amenities and hosts the popular Music in The Meadows series of outdoor concerts. Paintbrush Park is located next to The Grange. Here you will find outdoor amenities for all interests. Ridgeline Open Space and trails are the newest addition to The Meadows. Outdoor enthusiasts will appreciate the 370 acres of open space. Bison Park is a unique area with turf fields, which saves the community 2.5 million gallons of water. Philip S. Miller Park includes 230 acres. Indoor and outdoor amenities can be found here. There are plenty of activities available in The Patios at The Meadows. Here is a sample of some of the clubs, activities and classes offered here. Patio villas are attached residences that range in size from 1,552 to 1,733 square feet. These homes include one to two bedrooms, one-and-a-half to three bathrooms, and an attached two-car garage. An unfinished basement includes the option to add an additional bathroom or extra entertaining area. There are five patio home models that include 1,714 to 2,144 square feet of living space. These homes include a variety of options with one to three bedrooms, one-and-a-half to three-and-a-half bathrooms, and an attached two-car garage. These single-family homes also include an unfinished basement that can be completed with an extra bathroom. 55places.com is not affiliated with the developer(s) or homeowners association of The Patios at The Meadows. The information you submit is distributed to a 55places.com Partner Agent, who is a licensed real estate agent. The information regarding The Patios at The Meadows has not been verified or approved by the developer or homeowners association. Please verify all information prior to purchasing. 55places.com is not responsible for any errors regarding the information displayed on this website.